What Day Of The Week Is June 7? 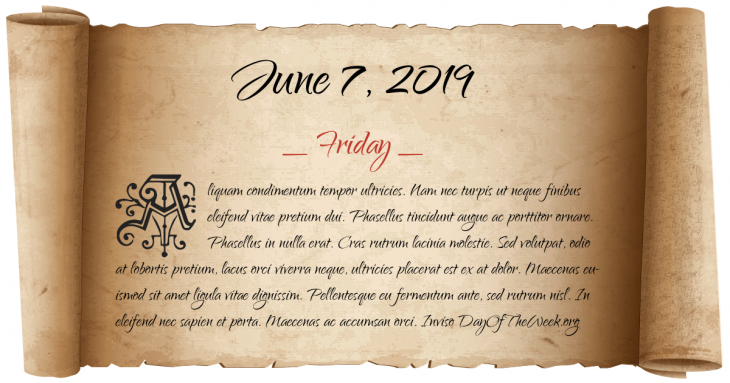 June 7, 2019 is the 158th day of the year 2019 in the Gregorian calendar. There are 207 days remaining until the end of the year. The day of the week is Friday. If you are trying to learn French then this day of the week in French is vendredi. Here’s the June calendar. You can also browse the full year monthly calendar. Gemini is the zodiac sign of a person born on this day. Pearl is the modern birthstone for this month. Moonstone is the mystical birthstone from Tibetan origin that dates back over a thousand years. The First Crusade: The Siege of Jerusalem begins. Port Royal, Jamaica, is hit by a catastrophic earthquake; in just three minutes, 1,600 people are killed and 3,000 are seriously injured. David Thompson reaches the mouth of the Saskatchewan River in Manitoba. During the French intervention in Mexico, Mexico City is captured by French troops. American Temperance crusader Carrie Nation begins her campaign of vandalizing alcohol-serving establishments by destroying the inventory in a saloon in Kiowa, Kansas. Cunard Line’s RMS Lusitania is launched at the John Brown Shipyard, Glasgow (Clydebank), Scotland. Sette giugno: Riot in Malta; four are killed. King Haakon VII of Norway, Crown Prince Olav and the Norwegian government leave Tromsø and go into exile in London. Priscilla Presley opens Graceland to the public; the bathroom where Elvis Presley died five years earlier is kept off-limits. The long range Boeing 777 enters service with United Airlines. Who were born on June 7?